Wounded Times: Stolen Valor: Topped off applying for job with city of St. Lucie? Stolen Valor: Topped off applying for job with city of St. Lucie? Among the discrepancies Byrne noted were that the Distinguished Service Medal was only awarded to four U.S. Army soldiers between 1983 and 2013 -- Liroff was not among them -- and that his Silver Star Medal was spelled incorrectly. PORT ST. LUCIE, Fla. - A Florida man who passed himself off as a war hero and applied for a job with the city of Port St. Lucie was arrested after it was discovered that he never served in the military, police said. 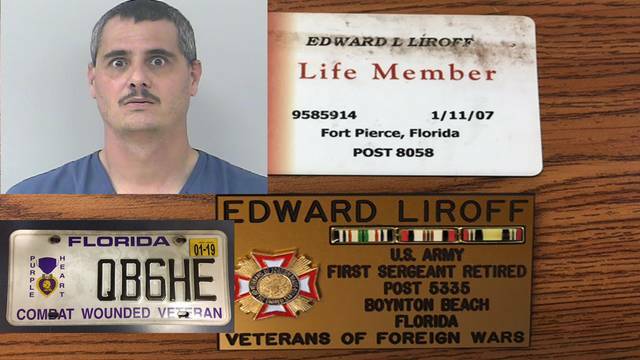 Edward Liroff, 46, was arrested Tuesday on felony charges of fraudulently obtaining a Florida driver's license, uttering a forged instrument and unlawful use of uniforms, medals or insignia.